Want a rewarding and enriching experience? Volunteer to be a READ tutor. English as a Second Language (ESL) or attaining their G.E.D. Who can be a READ Tutor? 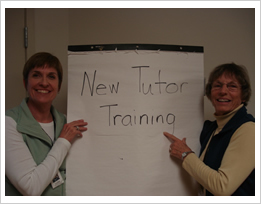 Any community member is welcome to be a tutor. Tutors are required to keep the names of students confidential. One to two hours per week for each student. Twelve hours of training is required; divided into 3 sessions usually offered in the Spring. You can get started by downloading and returning this form. We tutored S at our local drug and alcohol rehabilitation center. She is a bright and talented person who had gotten into trouble with the law. She dropped out of high school, and therefore needed to get her GED. After working with her tutor on GED materials, S passed all 5 GED tests. She has been released from the treatment center and is ready for college. R needed to get his GED. He needed help with the math portion of the GED. His tutor helped him use his love of playing video games in a different way. The tutor suggested that R reward himself after finishing his practice work with a session playing video games. . After 2 months with his tutor, R passed the Math GED. Y and her husband and young child came to this country from South America. Y was only able to speak a few words in English and was having great difficulty communicating with her child’s school. The READ tutor was able to help Y with her child’s parent-teacher conferences and improve her conversational English. After working with her tutor for more than a year, Y was able to serve the READ Program by acting as a translator for a new Spanish speaking student.